CNN “…we’re out there trying to manipulate governments”, under fire for #fakenews, more likely voters distrust the news. In the video the producer goes on to say that the News is a business and to ignore journalism ethics. The obsession with “the Russia thing” and President Trump is not new and has further fueled the President’s narrative against “fake news” a term coined during the presidential election campaign by Donald Trump. The fake news narrative validates what many moderates and conservative has long rallied against; media bias. Read our recent op-ed here. 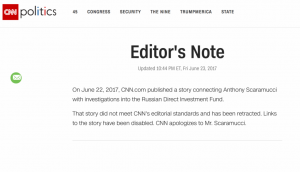 The latest scandal at CNN has resulted in the forced resignation of three journalists and additional scrutiny, allegedly, by CNN editors over any Trump-Russia story. This confirms what President Trump has been saying since he entered the presidential race in 2015. The President has attacked “fake news” and has targeted particular outlets. During the presidential campaign Trump cited “unfair coverage” of his campaign and also defended rivals, Socialist Bernie Sanders, and Republican Dr. Ben Carson for the media’s unfair coverage. President Trump, as he did during his campaign, has continued to use Twitter to attack and insult journalists. He banned some media outlets, notably CNN, from his press conferences. As President, he has continued this action. The latest is the banning of cameras at the daily White House briefings. CNN’s Jim Acosta has been the most “vocal” in the tantrums that he has thrown. Acosta reported that Trump did not visit Scalise, and then issued a “correction” on June 14th. 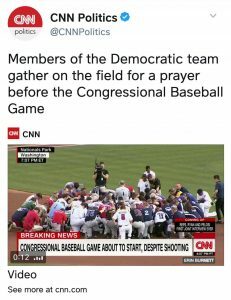 CNN reported that only Democrats prayed before the Congressional Baseball game with a picture of all participants, Republicans and Democrats. 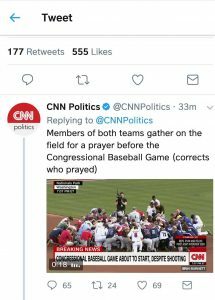 CNN issued a correct on June 16 via twitter. This may be the answer your below stated question, Mr. Acosta. Has the media treated President Trump worse then President Obama? Since President Trump took office, over 550,000 new jobs have been created and the stock market has reached an all-time high, spiking by more than $3.5 trillion. The economic optimism is at a high not seen since 1984. Former FBI Director Comey stated under oath that Trump was not under investigation, including ties to Russia. CNN, along with other networks, have taken the victimization approach. This approach does not address the fundamental issue; media bias. Perhaps the real example being set is in fact by the media that one is not responsible for ones’ actions. The media bias has become a norm in our society and it has gone largely unchecked by viewers and sponsors. A June 21st Rasmussen Poll indicated 20% of Likely U.S. Voters believe news stories that are based on anonymous sources. In January, Rasmussen found that 75% of likely US voters watch Cable News for political news at least occasionally. Fox News viewers polled at 50% trust Fox News, compared to 43% that trust MSNBC and 33% who tune into CNN. In total, only 37% of those polled trust the news that they are getting. A poll in September 2016 indicated that only 88% of Trump supporters believed the media skewed the facts while 59% of Clinton supporters trusted the media. The polls are similar to the ones conducted in 2016 and 2015. These polls suggest the “fake news” debacle has some truth. The media’s response has been to double-down, spin the victimization, and continue to disregard the fundamental problem of ethics and standards in journalism. The media, in particular CNN, has continued to make the story instead of reporting the story. Journalism 101 relies on the notion that “we report the story, not become the story”. The narratives this week are on the lack of video and camera’s at the daily briefings, President Trump’s threat to end the press briefings, and reading between the lines. In a headline recently a major outlet reported the “creepy comment” made by President Trump about an Irish reporter while on the telephone with the Irish Prime Minister. The headline read something like “President Trump called out for singling out Irish Reporter in the Oval Office: Just Creepy” and “Donald Trump’s creepy flirting with Irish TV reporter in Oval Office”, and “Trump interrupts call with Irish prime minister to hit on Irish reporter”. The comment to create the flurry of “creepy comment was specifically “She has a nice smile on her face so I bet she treats you well” President Donald Trump. This is an image of the situation when said “creepy comment” was made.